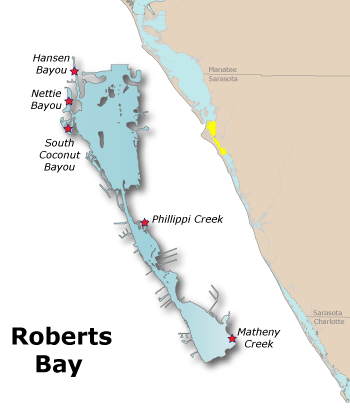 The overall health of Roberts Bay has decreased due to an alert level of chlorophyll a and below the target level of seagrass. The other two water quality indicators, (nitrogen and phosphorus) were rated as pass. Water quality: Only two water quality indicators (nitrogen and phosphorus) were rated as pass (below the threshold) and remained in "Excellent" condition. Nitrogen levels have remained constant and below the threshold (0.540 mg/l) but slightly above the target level of 0.450 mg/l. Phosphorus levels have decreased with the average below the target level (0.190 mg/l). Chlorophyll a levels have greatly increased since 2009 and are now scored as alert because levels exceed the threshold of 0.011 mg/l.